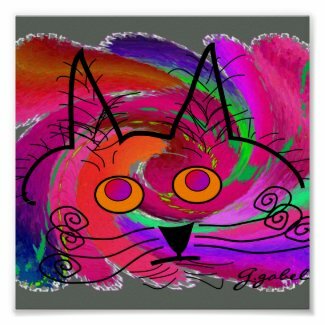 A piece of abstract cat art makes a fantastic gift for cat lovers who also love art. Sure, traditional cat art is extremely popular and you will find an assortment of great pieces. But if you truly want to dazzle that special cat lover friend, give him or her a gift of abstract, cat-inspired art. So what types of abstract art cat you find? Online, you will easily find posters and prints showcasing unique cats, among other artworks. Fortunately, you can find beautiful pieces at affordable prices. You will find several gift ideas below. Before we continue, let’s define abstract art. Abstract art, also known as non-objective art, relies more on internal (or subjective) sources than on external (objective) references. This art form moves away from realistic representation and focuses on patterns of lines, structures, and colors. There are, of course, many levels of abstraction in art. For example, you will find that some pieces showcase just a splash of color while other semi-abstract works bend reality just a little. There are artists who focus on partial abstraction. Unlike complete abstraction, in partial abstraction you still recognize some figures and images but they are blended with colors and patterns. In other works, realistic images are altered to varying degrees. For instance, in The Cat by Pablo Picasso (shown below) you can clearly see the profile of a cat, albeit it is not a completely realistic depiction of a feline. This piece is a good example of partial abstraction. Also, most artworks depicting anthropomorphic cats have some level of abstraction. By the way, English artist Louis Wain is famous for his anthropomorphic felines. Interestingly, abstraction shows up in different art styles. Some of the art movements that have promoted partial abstraction include: cubism, fauvism, and futurism. Abstraction also appears in many forms of art: painting, sculpture, music, and even film. Many artists have painted/drawn/created abstract cats. The following is a small sample of such artists. You will find the name of one of their cat pieces in parenthesis. Find the works of these artists using the search box below, courtesy of Art.com. You can either search by title or artist's name. Picasso’s Still Life with Cat and Lobster (1962) and Cat and Crab on the Beach (1965) are wonderful examples of partial abstraction in art. You can still the shape of the cat but it is somewhat distorted. Another great piece of abstract cat art is The Cat also by Picasso. Among my favorite abstract cat art pieces are A Hardworking Cat by Ken Bailey and Cat Love by Rosina Wachtmeister. Both these pieces manage to depict cats’ unique form and nature while adding a touch of abstraction. An interesting work of abstract cat art is Jethro, Mr.October by Miss Linda, in which the beauty of a black is perfectly represented. Cat II by Penny Feder is another wonderful example of an abstract cat. You can find these pieces and other similar works on the virtual store below. As you can see, there are many options of abstract feline art available. Needless to say, all these make great gifts for cat lovers. Is your cat loving friend a serious art lover/collector? Many a cat lover would love to receive a simple picture of a cute kitten. But if your friend has more sophisticated tastes, a gift of abstract art will absolutely delight her. The following gift ideas are brought to you in association with Zazzle.com. Start selling my artwork online at Zazzle.